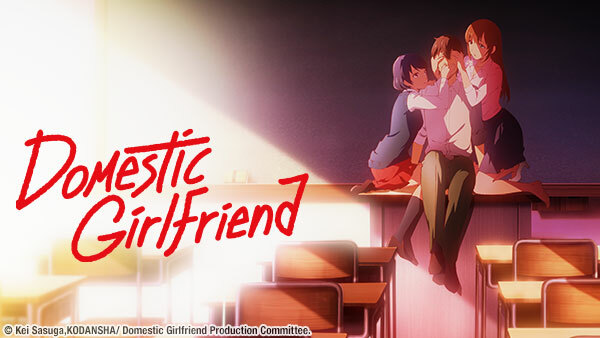 Sign up now to stream Domestic Girlfriend, subs, tons of dubs, OVA's, simulcasts, plus the all new Dubcast℠ editions and more! Crime doesn’t pay and the punishment doesn’t always fit the crime — a lesson Natsuo experiences firsthand after ‘borrowing’ a book from the library. E1 | Will You Do It With Me, Here? Natsuo’s life takes a turn for the complicated when his crush (and the girl he recently slept with) become his new stepsisters! E2 | By Any Chance, Did We Do It? E3 | Is It True, After All? Natsuo learned the truth about Hina's mysterious relationship. Following an intense encounter with her, Natsuo leaves home to cool off and establishes a connection with Rui. E4 | And… What About You? E5 | Is it Okay… If I Fall For Him? Rui makes a new friend with a notorious reputation — and an uncomfortable attraction to Natsuo. E7 | This Is What It Means To Go Out Together, You Know? Natsuo’s perception of Hina changes when she reveals how she first met Shuu. Later, Rui comes to Natsuo with a surprising request — one he isn’t sure he should fulfill. You can only lie to yourself for so long. As truths come bubbling to the surface, consequences ripple through Natsuo’s entire household. E9 | Don’t Say That, Please? Hina puts her plan to move out into motion. Neither Rui nor Natsuo wants her to leave, albeit for different reasons. Will their home feel the same without Hina in it? E11 | Are You Sure? Rui makes a decision after her conversation with Natsuo. Later, Natsuo’s class takes a field trip to Okinawa, where feelings are laid bare beneath the light of fireworks. E12 | I’m Sorry, I Love You. When the unthinkable happens, Hina expresses her love for Natsuo the only way she can: by giving him a chance to move on.